James David Christie has been internationally acclaimed as one of the finest organists of his generation. He has performed around the world with symphony orchestras and period instrument ensembles, as well as in solo recitals. His career was launched after he won First Prize in the 1979 Bruges (Belgium) International Organ Competition, where he was the first American ever to win First Prize and the first person in the competition’s eighteen-year history to win both the First Prize and the Prize of the Audience. He has served as Boston Symphony Orchestra organist since 1978, and given more than fifty tours of Europe and performs regularly in Canada, Asia, Australia, and Iceland. Mr. Christie is professor and chair of the organ department at the Oberlin College Conservatory of Music, distinguished artist-in-residence at College of the Holy Cross, and college organist at Wellesley College. He is music director of Ensemble Abendmusik, a Boston-based period instrument orchestra and chorus specializing in sacred music of the seventeenth and eighteenth centuries. He was awarded an honorary Doctor of Fine Arts from the New England School of Law for his outstanding contributions to the musical life of Boston, and the New England Conservatory honored him with its Outstanding Alumni Award. 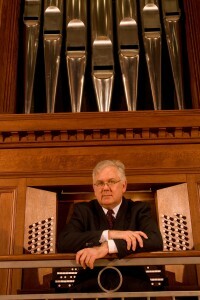 He has served on more than forty international organ competition juries in the United States, Canada, Europe, Russia, and Japan. He has recorded extensively and received several awards for his solo recordings.